Spring is such a welcome season of new beginnings after the chills of Winter! Our gardens and hedgerows are splashed with touches of lime green as leaves uncurl and bulbs push their way through damp soil to scent the air. Always a busy time for our florists planning weddings and gathering new ideas and designs for bridal bouquets. The trend for the soft romantic look using seasonal flowers and foliage continues with pops of colour for our more Boho brides! 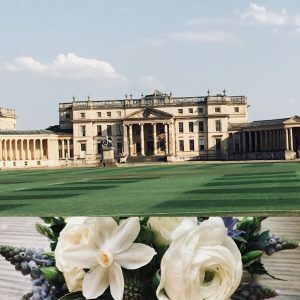 We are also working with the Events Team at Stowe House in Buckinghamshire for an exclusive wedding event on the 16th March 2019. If you are planning your wedding do come along and join us, we would love to meet you. Just email your enquiry and we will get in touch. For special offers, news and discounts subscribe to our mailing list on our home page. Make sure you follow us on Instagram too!